This portrait exemplifies the more romantic image of the artist that emerged in the later eighteenth century. In tune with the new ideas of’sensibility’� which stressed an emotional sensitivity to nature — the landscape painter Paul Sandby is shown in a relaxed attitude, sketching a view beyond the open window. 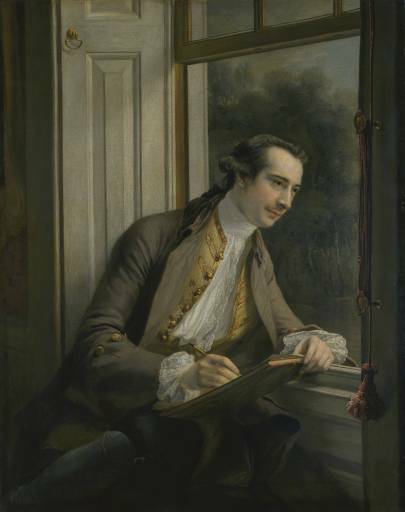 Sandby ‘s enraptured gaze and the fact that he is looking out of the window emphasises his emotional involvement with the scene he is drawing. A more traditional portrait would show the painter self – consciously presenting himself to the viewer.